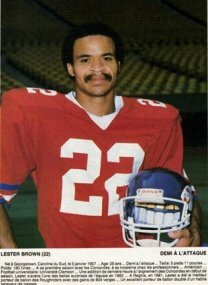 Lester Brown was a solid running back who played eight years in the CFL from 1980 to 1987 with five different teams. Brown never cracked the thousand yard mark rushing, but he was put up good stats as both as a runner and catching the ball, as well ad returning kickoffs. Brown was a seventh round draft pick of the NFL's Dallas Cowboys, but signed with Saskatchewan as a freee agent after his release by Dallas. In just seven games in his rookie season, Brown ran for 590 yards and caught 23 passes. In his first full season in 1981, Brown upped his numbers to 804 yards rushing an 32 catches. The Riders, however, traded Brown to Montreal for cash before the 1982 season In his first season in Montreal, Brown was used more as a receiver out of the backfield as he set a career best 61 catches for 654 yards while rushing for only 388 yards on 87 attempts. In 1983, Brown was used more as a running back with 48 catches for 792 yards and 37 catches. Brown was traded to Toronto in June, 1984 for LBGord Elser, and played 1984 and the start of 1985 with the Argos. 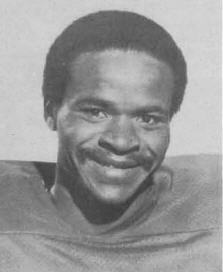 In his full season with the Argos in 1984, Brown won his first Eastern All-Star seleciton, running for 594 yards and catching 53 passes for 780 yards. Toronto released Brown early in the 1985 season and he was signed by Ottawa. Between the two clubs Brown had 537 yards rushing and 31 catches in only 11 games to pick up his second straight Easern All-Star at running back. After playing only 9 games with Ottawa in 96 an running for 411 yards, Brown was traded to Winnipeg for the 1986 season. Brown stayed in Winnipeg for two years (1986-87), but only played in nine games total for the Bombers. Brown finished his career with 4586 yards rushing and 275 catches for 2861 yards.